Whether one looks to bike, raft or explore this great country and learn about its impressive history or, better still, taste its great recipes from the Pacific coast to the height of the Andes, once hooked on Peruvian culture culinary or otherwise, one never has enough of it. 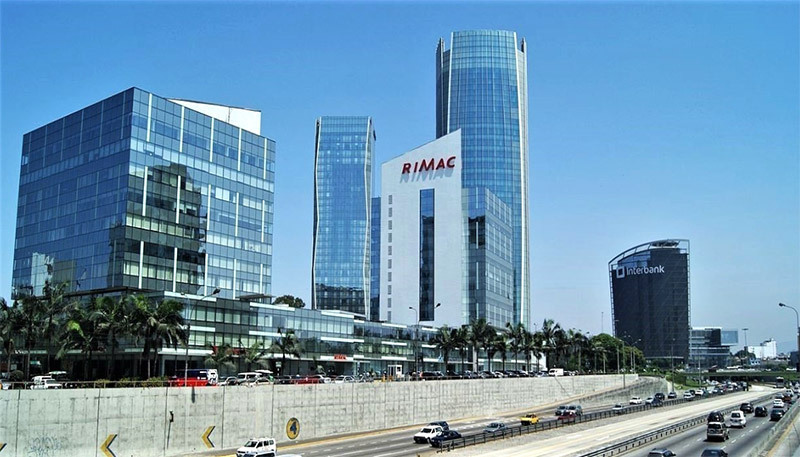 As a matter of fact, there is so much to tell about the country that there is no alternative really than show and tell as we go along, starting of course with its capital, Lima. The first thing one look for is a nice place to drop one’s bags and be welcomed. An international hotel chain is not really what you’re looking for because most of us wanted to experience local hospitality, not one the same fare-found-anywhere-else. A boutique inn or small hotel locally owned is recommended. 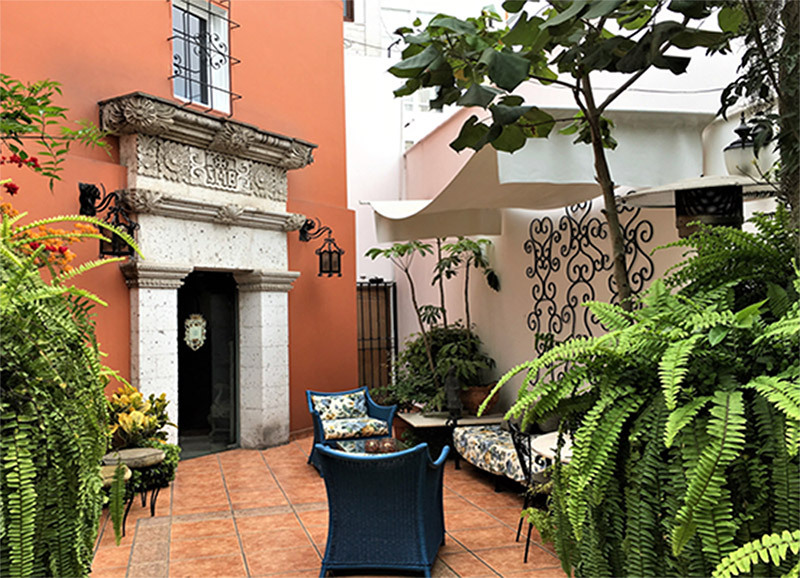 Such a quaint place, for our purpose, was the Villa Molina located in the quiet and safe Miraflores district of the capital, which is close to some great shops and restaurants. Lima is a mix of ancient, colonial, and modern architecture, with great museums such as the Museo Rafael Larco Herrera and its thousands of pre-Columbian artifacts of many cultures that make Peru’s past so fascinating: from Caral (3600BC), among the oldest cities in the world, to the capture of the Inca empire by foreign people from the Old World in 1532. The city is spread out in the Chillon, Rimac, and Lurin river valleys on the central coast of the country. Peru’s capital was founded on January 18, 1535 as the Ciudad de los Reyes by the Spanish conquistador Francisco Pizarro. It is home to the oldest institution of higher-learning in the New World: the Universidad Nacional Mayor de San Marcos, which was established by a royal decree from Charles.V, Holy Roman emperor on May 12, 1551, and is the oldest continuously functioning university in the Americas. The 9 million-plus metropolis offers a lot of historic and modern places of interests, from architecture to culinary discoveries. Shops and restaurants are everywhere but, as in other places, one need to be aware that one is a “tourist”, looked at as anywhere else, as a different “person” by locals. Peruvians however, are welcoming and gracious folks, both in the city and the countryside. In 1532 Atahualpa Inca defeated his brother Huascar Capac at the battle of Quito (Ecuador). On his way to Cusco to claim the title of Sapa Inca, sole ruler of the Tahuantinsuyo, with his army, he stopped at Cajamarca. Pizarro, had arrived from Piura with a handful of ruthless and desperate men, met and captured Atahualpa at the Battle of Cajamarca on November 16, 1532. The odds of capturing the Inca empire were so low that they seemed absurd. Yet he and his 168 men overcame the impossible, defeating the Inca’s army of several thousands, aided in the process by modern weapons, military prowess, the recklessness of despair and the antagonism between the two ruling brothers that had split the country. This was a socio-political fracture the Spaniards understood and exploited. Pizarro learned well from Hernan Cortes, conquistador of Mexico. 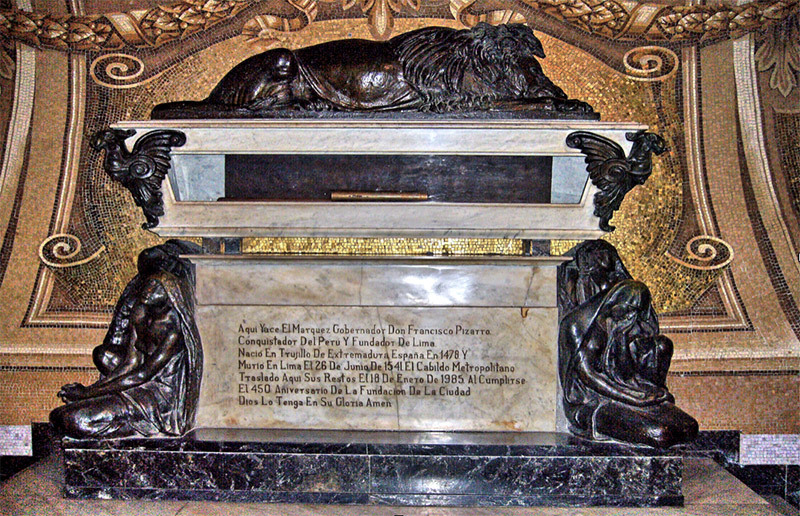 The city’s founder, Francisco Pizarro’s sarcophagus may be seen in the beautiful Basilica-Catedral in the city center. Pizarro’s remains were not always in this sarcophagus. 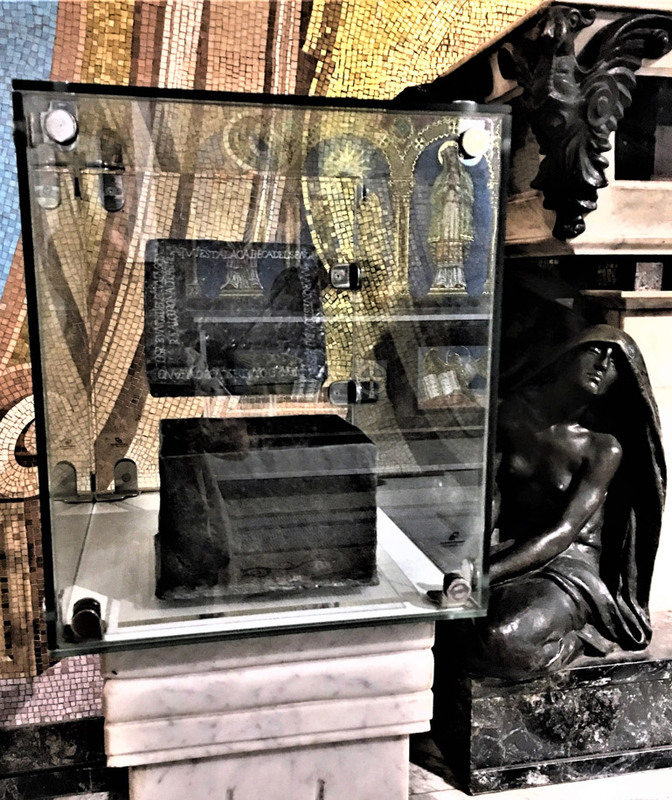 In 1977, a crypt was found with a metal box containing a skull and upper vertebrae, which were held together with a piece of a sword’s blade. On the box, writings stated that the remains were those of the conquistador. 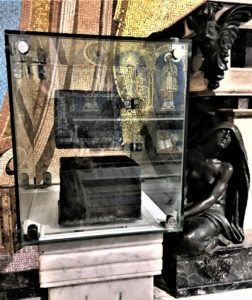 The box was sent to the University of Missouri Museum of Anthropology for forensic identification and the skull and vertebrae indeed belonged to Francisco Pizarro, who was killed in 1541 in a sword fight with a former follower. The sword trust was driven under his chin and into his skull. 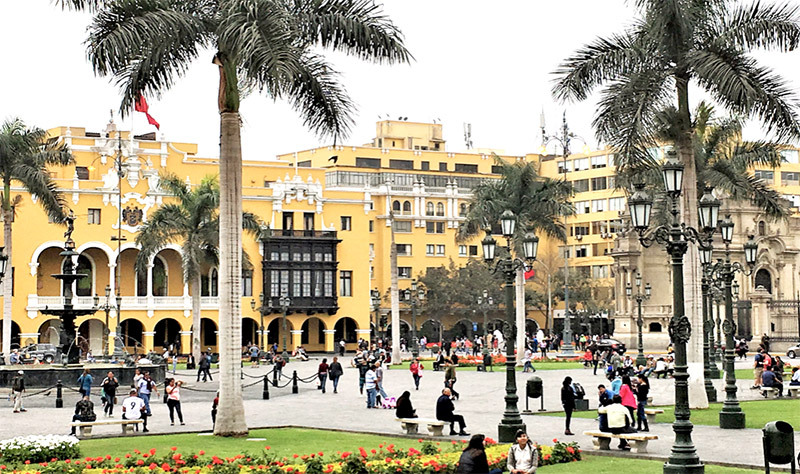 Beyond history, Lima is a dynamic 21st century city connected to the far corners of the political and business worlds. From banking, finance and insurance to construction, telecommunications and manufacturing, automotive and marine, internet and satellite services, Peru offers a friendly environment, backed by a solid government and a legal infrastructure. From the Amazon to the Pacific coast through bustling cities, the country offers visitors a remarkable mix of the modern world together with the opportunity to learn, visit, and enjoy the unique cultures of its past. No less unique is its topography, the breathtaking vistas of the great Cordillera de los Andes, the fascinating southern desert, and the unique Nazca geoglyphs, are unforgettable. 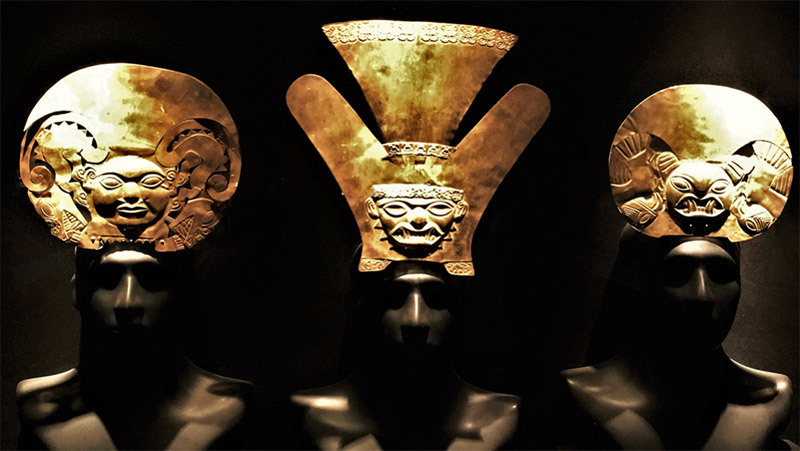 There are 64 museums in Lima among which are the Museo de la Inquisicion, the Amano Pre-Columbian Textile Museum, the Museo del Oro, the Museo de las Armas del Mundo, and the Museum of Modern Art among others. The Museo Rafael Larco Herrera however, was top on my “must see” list. Thousands of tourists and international scholars visit the museum for references otherwise unavailable in their locations. The collection of over 23,000 pieces is unique and represent rare artifacts from ceramic, wood, bone, and the enigmatic knotted llama wool ropes, the quipus. Its collection of precious and semi-precious metals from the Moche, Sican, Inca, Nazca, and other cultures, is no less impressive, such as the gold and turquoise pair of earspools below. The museum collection was inaugurated on July 28, 1926 as the Museo Arqueologico by Rafael Larco Hoyle, who named the museum after his grandfather who started the collection in 1903. Rafael bought collections from other Peruvian amateur archaeologists, such as the Carranza Collection in Trujillo of 3000 pieces, and the famous Roa Collection of more than 8000 specimen of pottery, metalwork, and textiles. Larco II named the museum in acknowledgment to the elder Larco for having ignited in him a passion for Peru and its ancient past. In the 1930s Larco found himself surrounded by dust and sand, conducting research in the harsh coastal deserts of northern Peru. The more he excavated, the more tombs he discovered pertaining to the region’s most advanced cultures, namely the Moche and Chimu. 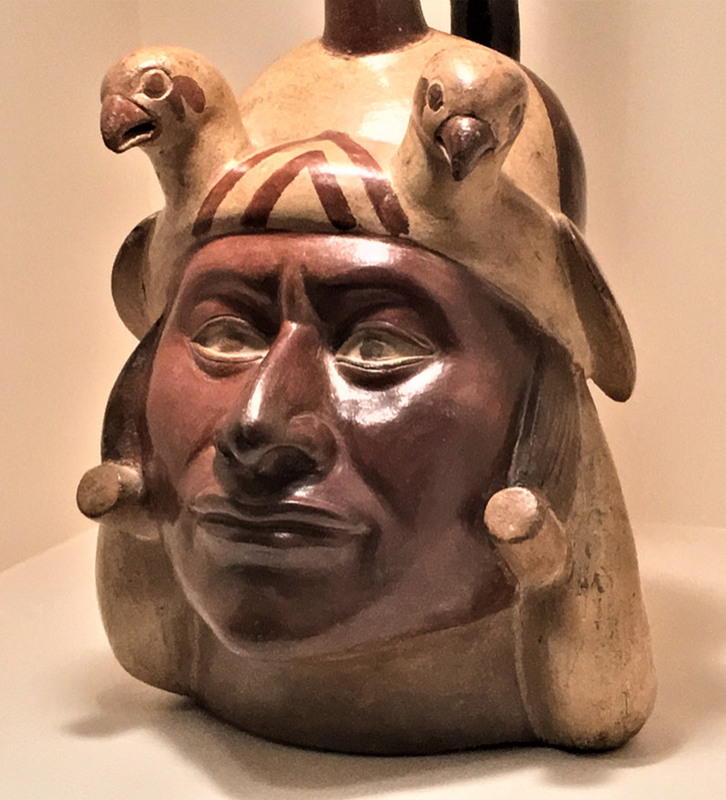 Fascinated by the amount of information the Moche ceramic vessels provided, he began the monumental task of studying and recording practically every aspect of the lives of the people of this rich culture. As a result, in 1938 he wrote his monumental work Los Mochicas, which was published in 2001. He established a general chronology to enable a better understanding of the emergence and development of distinct pre-Columbian histories, by defining the chronological periods during which they developed. After discovering the Cupisnique culture, he proposed that it was the earliest origin of advanced culture in Peru. 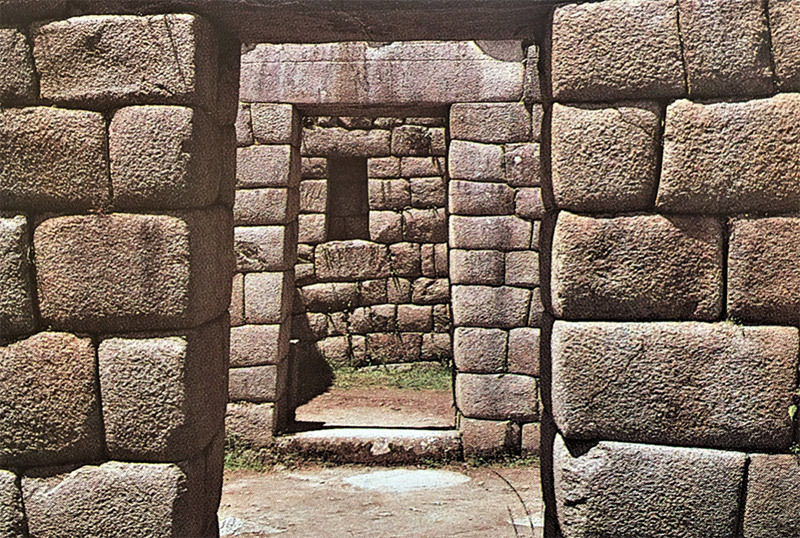 The hypothesis clashed with the theory that placed the origin of Peruvian societal structures in the highlands, at Chavin de Huantar. Larco also discovered the Salinar and Virù cultures and identified their development as pre-Moche. But enough for the moment about history, how about food? The best Peruvian dish, known even outside Peru, is the cebiche among other excellent recipes of meats, vegetables, and huge imperial corn. Now some will argue that a Mexican, Ecuadoran, or Colombian cebiche is better. That is definitely a matter of opinion beside taste. Cebiche can be straight, i.e. fish, shrimp or octopus only, or a mix of the above and other seafood, together with red onions, two slices of sweet potato, corn and other mouthwatering ingredients. There are many recipes to be found on line. By the way, the excellent Cusqueña beer will definitely cap a fine cebiche. So now, ready to “hit” the streets again, let’s head for the historical part of the city, and its remarkable architecture that weathered centuries. 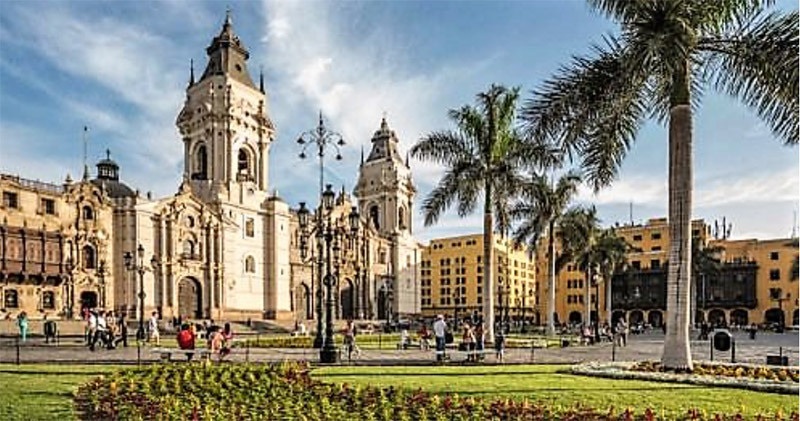 Lima does not have the remains of the Inca palaces Cusco, the great capital of the Quechua people, has. Cusco is a clash of cultures through architecture, underlined in a mix of colonial and Inca buildings that brings out a better perspective of the historical context of this great country. 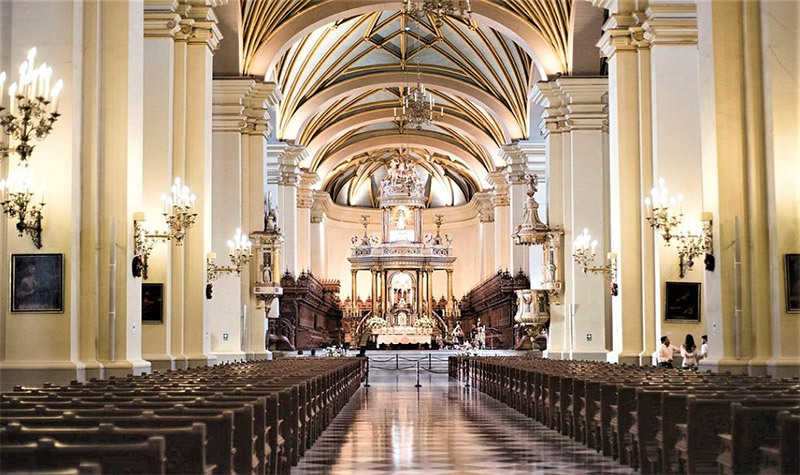 A few blocks from the Plaza de Armas is another location of interest, the Monasterio San Francisco de Lima and its catacombs, discovered in 1943, where over 25,000 people were buried until 1803. A Viceroy, Bishops and other dignitaries are buried there. The tombs are built out of bricks made of a strong mortar that allowed the building to withstand earthquakes. At the height of its time, the subterranean corridor system allowed to reach important buildings in the city such as the Cathedral, the Holy Inquisition Tribunal, and the Alcaldia (Town Hall). Walking distance from the Villa Molina hotel in Miraflores, a Lima central district, are two most interesting places: a very large pre-Columbian pyramid complex, the Huaca Pucllana from the Lima culture, that developed on the Peruvian Central Coast between 200 and 700. The complex also hosts a fine restaurant. 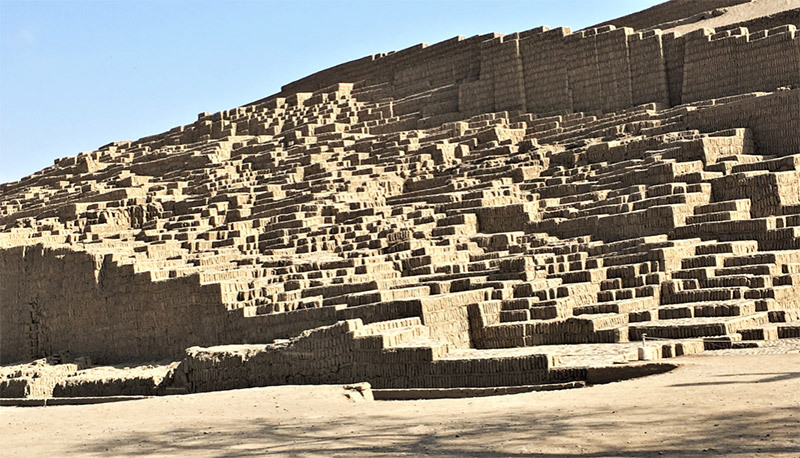 First history: the word huaca is a Spanish word that probably comes from the Quechua language, where wak’a refers to a local deity also used to refer to a sacred place such as an old earth mound, ancient structures and ceramics or other ancient implement. Pucllana generally translates as “game”. As an aside, huaqueros means “grave looters”, people that loot pre-Columbian graves in huacales in search of precious artifacts, a name used all the way up to Mexico. Huaca Pucllana is a massive complex whose surface area covers over two city blocks. Its actual footprint is 1700 ft/520 m long, 460 ft/140 m wide and reaches 92 ft/28 m in height. The ceremonial and administrative complex, built from eight staggered platforms, must have been much larger in its time before it was overtaken by buildings from the 19th century to date. It is made of over 148 million adobe bricks, all marked with the sign of the family group that made and set them up in a specific place on the structure. The marking helped the construction overseer to ascertain that a particular group fulfilled its quota of corvèe labor, owed to the Lord of the realm. The bricks were set vertically, as opposed to horizontally as in most other similar adobe structures on the coast. It is shown in the photo below at left that the brick’s footprint is set close but not in contact with each other, a space of about half the width of the thickness of the brick is left between them. The reason for the vertical set up of the bricks is not entirely clear; it could be a way of building taller and quicker by perhaps using less material overall, since one vertical brick seems to be equivalent to the height of two horizontal ones. It could also be the answer to a compression issue in terms of weight bearing in an earthquake prone area (Architect Eric Slazick, AIA, NCARB, LEED, Miami, FL). Few buildings with vertical brick construction are seen as they are mostly found on the coast, such as on some low buildings at Pachacamac, an important religious site and oracle south of Lima. 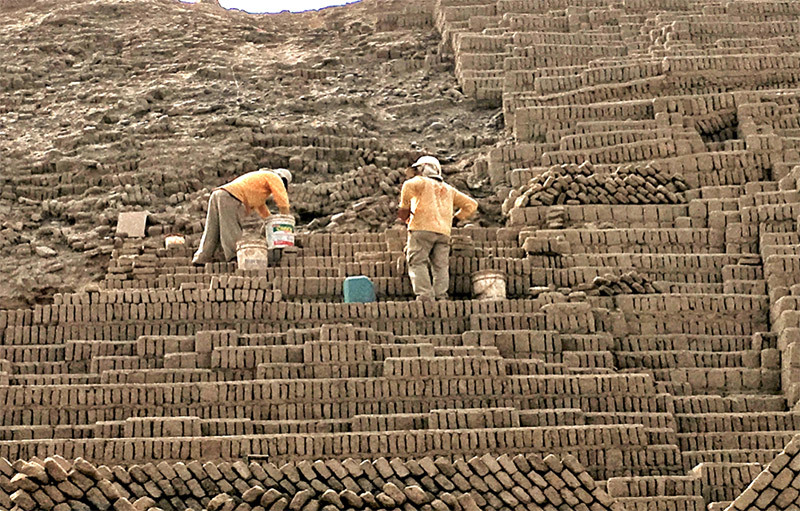 The use of adobe is largely due to the fact that the coast is poor in rocky material, but clay and sand with gravel stones in river beds, are abundant in addition to plant fibers added in the composition of the bricks. 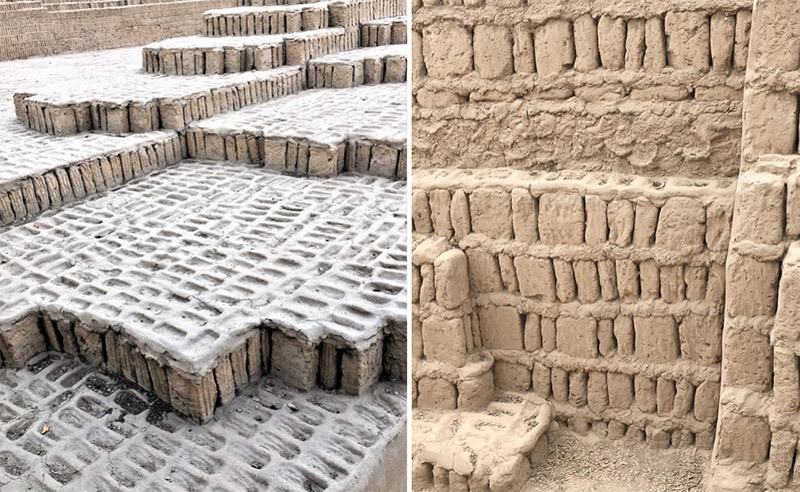 Remains from the Wari culture (500-900) were found at Huaca Pucllana that underline its influence over the local one toward the end of the time period. 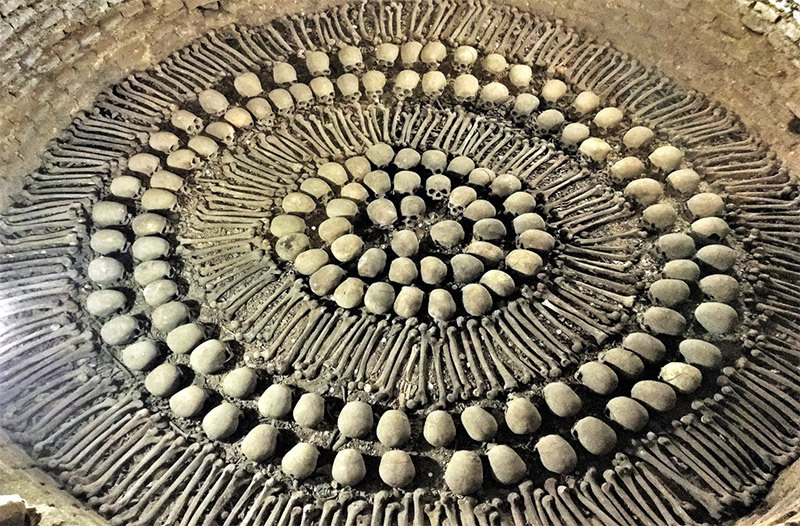 Of interest are the remains found attributed to the Señor de los Unkus, found intact in the first tomb within the ceremonial complex. Three separate funerary bundles were also found with two adults wearing death masks, a third without mask, and remains of a sacrificed child. It is possible that the last man and child were the sacrificed companions to the first two males, for their voyage into the afterlife. 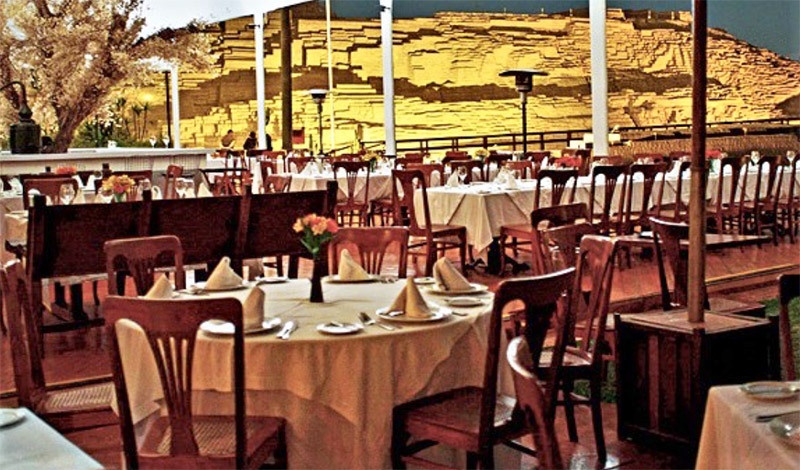 The Huaca Pucllana Restaurant is located at the entrance of the archaeological complex. It is one of the finest in Lima with excellent food and service. By the way in case you’re wondering, their Pisco Sour is second to none. The Huaca Pucllana Restaurant proudly maintains a philosophy that lies in the use of Peruvian ingredients as bases for its famous dishes. Meats and poultry, cooked in the ways of the coast or the high Andes, are also available. 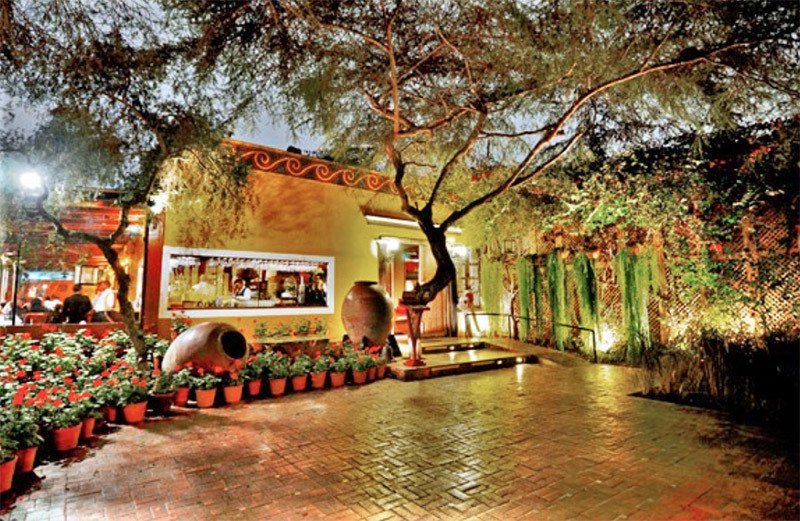 The restaurant stands out for its devotion to using local products of the best quality. With its chefs Marilu Maduro and Andrea Massaro, patrons are offered a delicious variety of local cuisine, from shellfish to seafood in all their flavors, and a wide selection of local vegetables cooked the traditional way. A wide selection of red and white wines from Peru and beyond will answer to the most demanding wine aficionados. Speaking of Pisco Sour, it is a cocktail of Peruvian origin considered a South American classic. Experts agree that the cocktail, as it is known today, was invented in the early 1920s in Lima by the American bartender Victor Vaughen Morris. 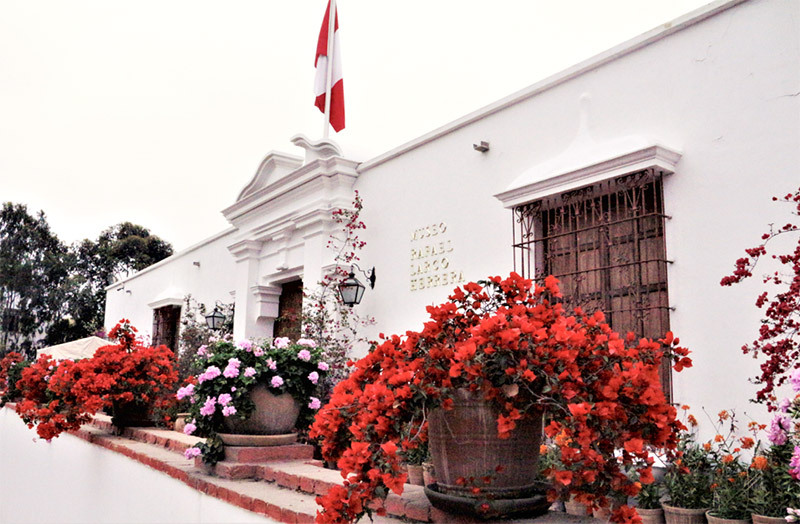 In 1916, he opened the Morris’ Bar in Lima that became a popular “watering hole” for English-speaking Peruvians and foreigners. Mario Bruiget, a Peruvian bartender working at Morris’ Bar, created the modern Peruvian recipe of the cocktail in the latter part of the 1920s, by adding Angustura bitters and egg white to the drink. Other folks will argue otherwise and claim ownership, among them Ecuadorans and Chileans. Chile and Peru both claim Pisco Sour as their national drink, and each assert ownership of the cocktail recipe, an oft debated topic of Latin American culture. So important it is that Peru celebrate a yearly public holiday in honor of the cocktail during the first Saturday of February. Now let’s close the day with checking a few Limeños late night haunts, and there are quite a few that will compare well among the best, anywhere else. 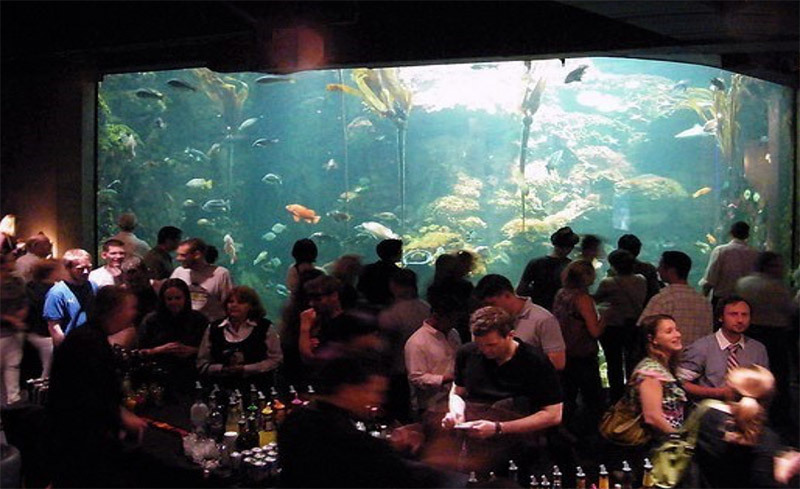 Young and dynamic folks have a good time in these cheerful places, where everyone unwinds from their daily grind. 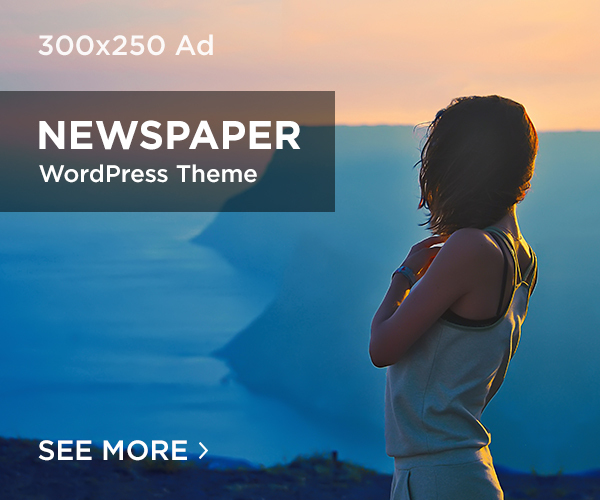 Such an evening will cap your visit very well indeed, so check them out, with my best wishes for a better than a great evening. There is much more to discover and understand this great country’s history. In fact, there is not a square mile that does not harbor fascinating cultures of today and yesteryears. From the Lambayeque valleys to the north, the Moche, the Sican cultures and the pyramids of Tucume, among others. The Nazca plains and their immense geoglyphs in the south, together with the cultures of Paracas and the Ballestas islands, will make you long to visit again even before you leave the country. Of course, the central Andes are unique, with the great Quechua city of Cusco and the neighboring UNESCO site Machu Picchu, and Sacsayhuaman, Ollantaytambo and other great Inca locations, not forgetting the unique Lake Titicaca and the ancient cultural remains on its Bolivian and Peruvian shores. On this site, we will soon walk through the doors of the past, including many strange beautiful places and people that made Peru’s history so captivating. 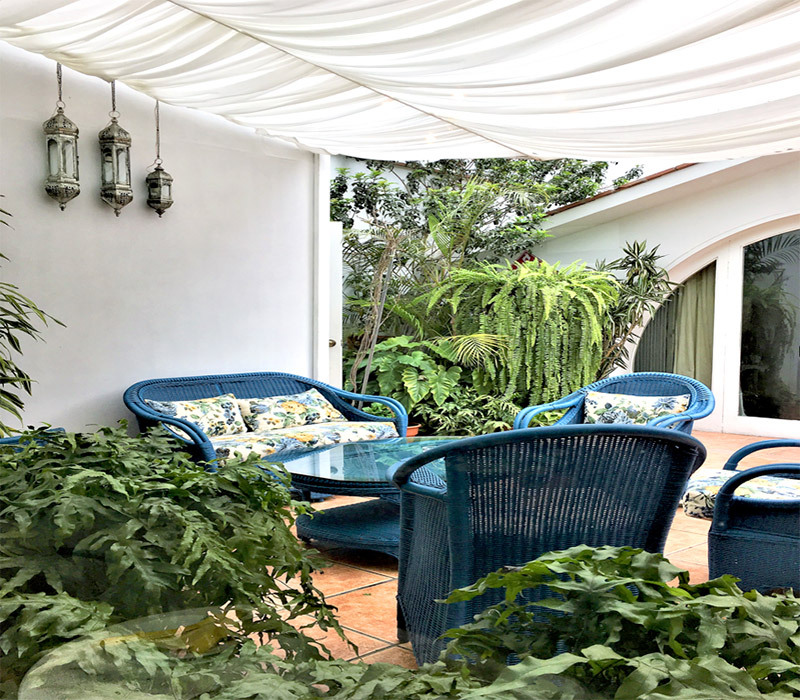 But enough for today, let’s unwind in the comfort and peace of our boutique hotel in Miraflores.